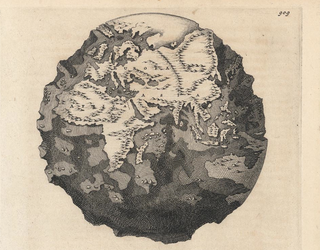 British theologian Thomas Burnet created this world without water in 1694 to reveal the landscape of the entire Earth. The map, however, was more than speculative geology — it was presented as evidence that the Great Flood of the Bible transformed our world from a smooth sphere into a bumpy mess. Burnet was famous for his book, Telluris Theoria Sacra (Sacred Theory of the Earth), which sought to reconcile the most recent advances in the natural sciences with religious scripture. He was especially troubled by the world's physical irregularities — the jagged mountains, subterranean caverns — that he felt contradicted the concept of God as a creator who embodied perfection. "What a rude Lump our World is that we are so apt to dote upon," he wrote of the Earth's deformed terrain, which he compared to the Moon's "rude and ragged" surface as recently seen through telescopes. "In this smooth Earth were the first Scenes of the World, and the first Generations of Mankind. It had the Beauty of Youth and blooming Nature, fresh and fruitful, not a Wrinkle, Scar or Fracture in all its Body; no Rocks nor Mountains, no hollow Caves, nor gaping Channels, but even and uniform all over." The landscape we see today, Burnet argued, was the wreckage of the "new Earth," the damage caused by the Great Flood. He had approached the topic (from his perspective) "scientifically"; he tried to calculate the exact amount of water required to cover the entire world. After he reached the conclusion that rain lasting 40 days and nights would be insufficient for the global deluge, he argued that the ﬂoodwaters had come from an underlying layer of water beneath the Earth's surface, released when the original crust cracked and collapsed. "We have now proved our Explication of the Deluge to be more than an Idea, or to be a true piece of Natural History," Burnet wrote. It was a foreshadowing of the increasingly imaginative — and difficult — efforts to reconcile science with scripture in the years to come. Image source: Barry Lawrence Ruderman Antique Maps.